Originally opened in 1833, the Sailors’ Snug Harbor is one of the oldest charitable institutions in the United States and was the first home of its kind for retired and disabled seamen in the United States. Seamen were admitted to the institution without regards to their nationality, race, religion, or rank which provided a unique ethnic community with many diverse backgrounds. Sailors' Snug Harbor was located on Staten Island, New York, for over 140 years. 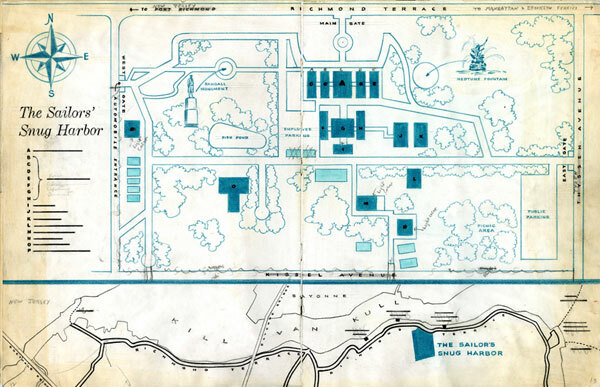 In 1976, SUNY Maritime College acquired the Sailors’ Snug Harbor archival collection which consisted of important documents and bound volumes of the institution. This collection of 665 objects presents a wide range of archival materials, including photographs, newspaper clippings, and financial documents relating to the history of this unique maritime institution in the years before it relocated to North Carolina in the 1970's.